Undeterred by the loss of a job, Oregonian Aaron Heideman turns his van into a home to canvas America. 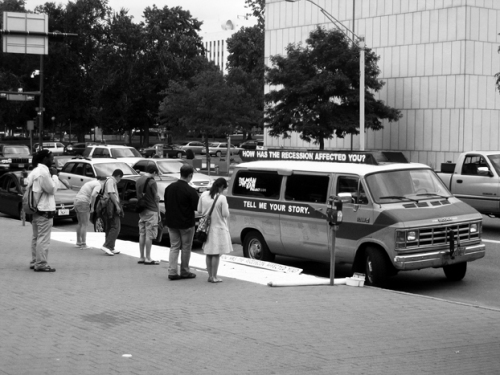 Artprize is a national contest for fine artists and emerging artists from all around the world. It is said to be one of the largest prizes that an artist can hope to win to get recognized for his or her craft. All of the winners are chosen by the public. The top prize is $250,000. For most, when they think of somebody that would be part of a contest like this they would not think of a poor man, a homeless man, as one of its participants. Artist/ driver Aaron Heideman aka “The Man in the Van” proves this theory wrong. “I don’t want to panhandle,” reiterates Aaron Heideman. After losing jobs during the recession his life was more than just a struggle. He hit rock bottom. But he took a creative angle on his situation and found some freedom from a 9 to 5 with a road trip that would eventually take him through at least 30 States in America. His mission: to make an enormous tapestry of people’s experience of the recession. State by state, city by city, he collected words. His project started out in Medford, which he calls home. Driving through places like Portland, Fresno, Las Vegas, Phoenix and Denver, he met all types of people and had them share their experiences from a sagging economy and what it has done to their lives.